Just confirmed from Games Workshop as coming soon! Ladies and gents of sweet hobby goodness. Straight outta nowhere has popped up a delightful little bit of exciting news! 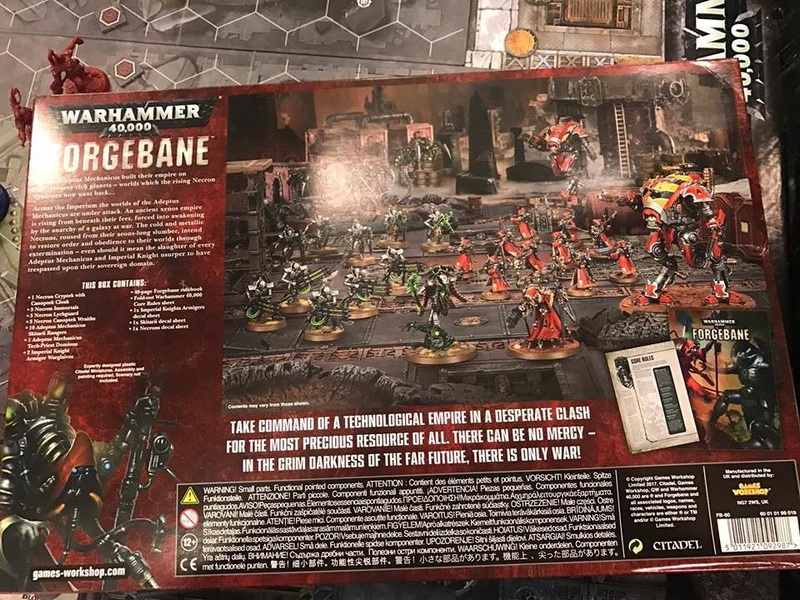 Forgebane, a brand new boxed game based on Warhammer 40K has been sighted! Taking us completely by surprise, the images here have been found circling the online webway. You can see the images themselves below. Robot wars at their finest! It appears to be a mighty robotic clash between Adeptus Mechanicus and the feared Necrons. It appears to be a straight-up Warhammer 40K box set, not a bespoke game with new rules, as you can see the 40K core rules sheet on the back. How exciting! Nothing has been commented on from Games Workshop just yet, so we’ll have to wait and see exactly what is what. Though consider that the Necron Codex is inbound and the Forgebane box itself containing a brand new Imperial Knight. These things will sell like hot cakes! For more stick with us here at TabletopGamesUK via our Facebook page. We’ll have more on this as it develops.